I started my next project. This one is called "Someday My Prince Will Come". It's another fairytale cottage a princess doll can call home until she meets her prince. It is a double turret house. 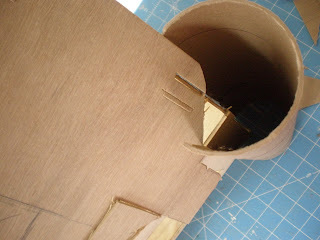 I cut out a curved top door with two sidelights on either sides. 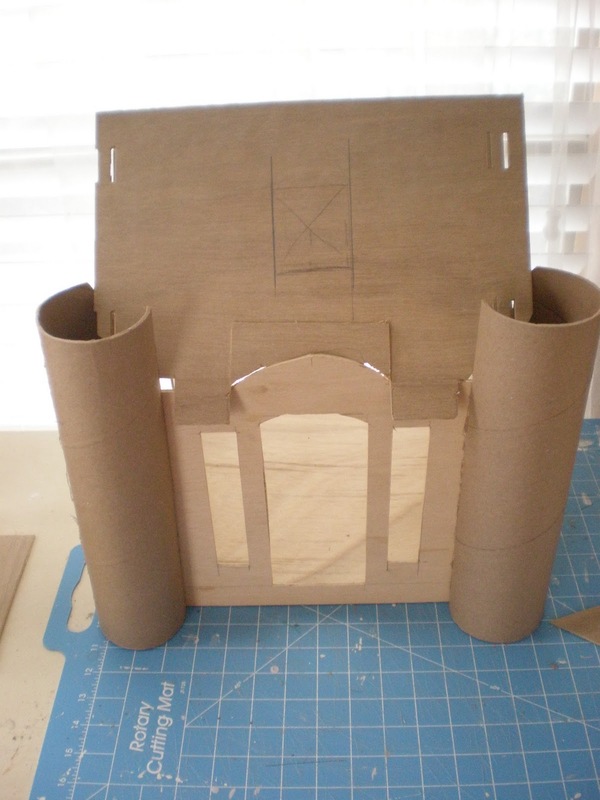 The turrets are two big cardboard rolls. They will be rock hard when I put the concrete on. They are just for show. If I cut out windows, I'm afraid the structure wouldn't be strong. So they'll just have to look pretty! Here I've cut out one more window in the roof. 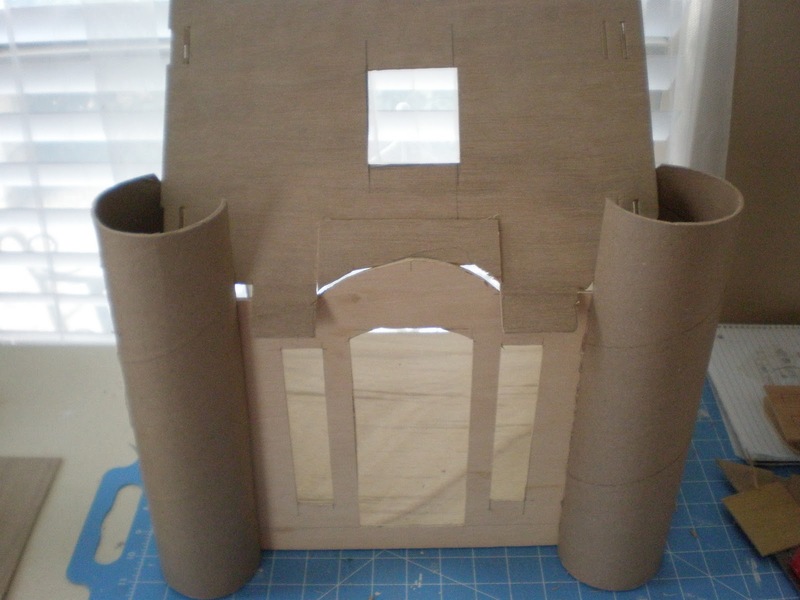 The roof will be thatched and the turrets and tiny window will probably be shingles. What a fun project, Caroline! I love the name--it reminds me of Bella the Bride Bunny from my blog. I can just imagine her singing, "Someday my prince will come!" ;-) Can't wait to see how this project turns out! Holy cow already? You are full of energy! This house is going to be amazing I just know it. I look forward to seeing how it comes along. Does it come with the prince??? Love the twin turret idea. I'm totally loving the 'concrete' as a finishing medium too. I still can't find my camera (I've obviously put it in some really weird place when dreaming instead of paying attention) but you'll be able to see what I've been doing with it as soon as I can post the treestump house pics. It's a very beautiful project. Ya has empezado tu nuevo proyecto? What a lovely idea, and the turrets look so nice, do you make little windows in the turrets as well ?? Well, since I still haven't met my prince, I'd better 'miniaturize' myself and move in, since there's no 'tall, dark, and handsome' princes on my horizon. P.S. I looked and I have ONE MORE POST to catch up on! I am just flabbergasted by your work, dear buddy. You TRULY have such beautiful, creative, and magical ideas... God has truly blessed you.